Avi Shlaim burst upon the scene of Middle Eastern history in 1988, with the publication of Collusion Across the Jordan: King Abdullah, the Zionist Movement, and the Partition of Palestine. Before that, as a young lecturer at Reading University in England, he had produced two books, British Foreign Secretaries Since 1945 (1977) and The United States and the Berlin Blockade, 1948–1949 (1983), and several revealing essays on modern Middle Eastern historical issues in academic journals. But it was Collusion Across the Jordan, with its 676 pages of solid and well-written research, that thrust him into the academic limelight. Shlaim’s book traced the thirty-year relationship between the Jewish Agency for Palestine and, later, the government of Israel and Prince Abdullah (later King) of Transjordan (later Jordan), focusing on their secret friendly ties and mutual interests--the “collusion” of the title--during the 1948 war, and their unsuccessful secret peace negotiations, which were suspended just before Abdullah’s assassination by a Palestinian gunman in July 1951. Shlaim argued that Abdullah and the leadership of the Yishuv, the Jewish community in Palestine/Israel, were united in their fear and their hatred of Haj Amin Al Husseini, the leader of the Palestinian national movement, and also in coveting the territory of Palestine; and so they agreed, in the run-up to the 1948 war, to “collude” to prevent the Palestinians from establishing a state. Bowing to the realities of power, Shlaim contended, the Hashemite king and the Zionists agreed to divide the territory between themselves. As it turned out, and despite fierce Israeli-Jordanian clashes in and around Jerusalem, this is exactly what happened in the course of the war, the Jordanians occupying and eventually annexing the West Bank--the core of the area allotted by the United Nations partition resolution of November 1947 for a Palestinian Arab state--and the Jews establishing the state of Israel on the remainder (minus the Gaza Strip, also allotted to the Palestinians, which Egypt occupied in the course of the war and held until 1967). And following the war, the two countries embarked on peace negotiations, but failed to conclude a deal. Shlaim argues that it was an unconciliatory Israel that was largely responsible for the diplomatic failure--as it was, also, for the failure to explore properly the options for peace with Syria and Egypt that opened up, in his view, in those immediate postwar years. Much of Shlaim’s spadework, especially relating to Zionist-Arab diplomacy before, during, and after the war, was original, but his thesis itself, about the nature of Jordanian-Israeli relations before and during 1948, was not. Israel Ber--who had served as an important officer on the General Staff of the Haganah, the Yishuv’s main pre-state militia that changed its name later to the Israel Defense Forces (IDF), and on the General Staff of the IDF in 1949–1950 (before his resignation, he headed its Planning and Operations Department)--had suggested the “collusion” thesis in his book Israel’s Security: Yesterday, Today, and Tomorrow, published posthumously in 1966. And Dan Schueftan and Uri Bar-Joseph had presented and analyzed it in their learned and well-argued works, A Jordanian Option (1986) and The Best of Enemies (1987). But Ber’s was an unannotated political essay by a discredited man--he was jailed in 1961 as a Soviet spy--and it appeared only in Hebrew. Schueftan’s work also appeared only in Hebrew, and Bar-Joseph’s drew little attention. Shlaim certainly did his work more thoroughly, and he wrote with verve and elegance. Though one or two critics suggested that Shlaim had given too much weight to oral testimony elicited decades after the events described, Collusion Across the Jordan enjoyed wide acclaim. Some of that, without a doubt, was owed to what was seen as the book’s anti-Israeli slant. In Collusion Across the Jordan, only one of the parties to the “collusion” was pilloried--the Yishuv and its leaders, chiefly David Ben-Gurion, chairman of the Jewish Agency Executive and, from May 14, 1948, Israel’s prime minister and defense minister. Ben-Gurion is portrayed as conniving, inflexible, and war-mongering. The other party to the “collusion,” Jordan, was let off by Shlaim with barely a slap on the wrist. Indeed, Abdullah was held up as a wise, noble, and peace-craving statesman--a portrait, incidentally, that greatly endeared Shlaim to the Hashemite princes, and did much to open doors for him in Amman for his subsequent biography of King Hussein, Lion of Jordan: The Life of King Hussein in War and Peace, which appeared in 2008. (Abdullah was Hussein’s beloved grandfather.) The fact that Abdullah, in defiance of the U.N. resolution of 1947, had occupied the core area of the proposed Palestinian state, and during the following years did nothing to promote Palestinian statehood in the West Bank, and, indeed, did a great deal to stifle Palestinian nationalism, and that in 1949–1951 he had proved unable to persuade and unwilling to force his Cabinet to endorse peace or even a limited non-belligerency pact with Israel--all this was somehow exempted from the moral fervor that characterized Shlaim’s treatment of Israel. In fact, The Iron Wall was more balanced than that. In the heat of his current pro-Palestinian righteousness, Shlaim forgets that The Iron Wall devoted many pages to the Israeli-Egyptian and Israeli-Syrian post–October War disengagement negotiations, which led to substantial Israeli troop withdrawals; and to the Israeli-Egyptian negotiations and peace treaty of 1977–1979, which saw Israel evacuate every last inch of the Sinai Peninsula; and to the Israel-PLO Oslo accords and the negotiations that resulted in the Israel-Jordan 1994 peace treaty. And while Ehud Barak’s (and Bill Clinton’s) efforts in 2000 to achieve an Israeli-Palestinian peace may not have been successful, they cannot be airily dismissed as “meaningless” diplomacy. Indeed, one can say that in the course of its sixty-year history, Israel has engaged in very meaningful diplomacy--and in diplomacy that resulted in its evacuation of huge swathes of territory (Sinai alone is three times the size of Israel) and in peace treaties with two of its Arab neighbors. Shlaim often refers to himself as an Israeli, though Wikipedia’s designation of him as a “British historian” is more accurate: born in Baghdad in 1945 and educated as a historian in Britain, Shlaim has lived in the United Kingdom since 1966. He was one of a small group who emerged in the late 1980s and were lumped together and designated-actually by me, in an article in Tikkun, an American Jewish journal--as the “New Historians,” their collective work being the “New Historiography.” I included myself and my own work in this rubric. It countered the “Old Historiography” of the “Old Historians,” which painted a roseate portrait of Zionism and its works. The “Old Historians” generally ignored, omitted, or otherwise swept under the carpet all that was morally reprehensible and dubious and unwise in the activities of the Yishuv and Israel before and after 1948. The “New Historians,” availing themselves of Israel’s very liberal Archives Law and its newly opened archives (and also British, U.N., and American material), published a series of books in the late 1980s that were critical of the traditional Zionist historical narrative. Collusion Across the Jordan was one of those transgressive books. Israel and Palestine, which will probably earn Shlaim more Israel-bashing brownie points than all his previous books combined, is a collection of academic essays and reviews, along with some journalistic articles about politics. The pieces are mostly an extended exercise in anti-Zionism, nothing more. There is also one interview, originally published in The New York Review of Books in 1999, in which Shlaim asks King Hussein about his meetings with Israeli officials and leaders from the 1960s until the 1990s, and about Jordan’s participation, or non-participation, in the wars of 1967 and 1973. The monarch’s responses are vague, fluffy, and imprecise (he often answers that he cannot remember but will later look for the relevant documents, which, of course, are never referred to again) and generally uninformative, heavily larded with avowals of goodwill and the love of peace. The scholarly essays deal with “The Balfour Declaration and its Consequences”; “The Rise and Fall of the All-Palestine Government in Gaza,” an impotent, short-lived organization established by the Egyptians in September 1948 as a means of controlling Palestinian politics, countering King Abdullah’s territorial, claims and, if one is prone to generosity, providing the Palestinians with some sort of representation; and “Husni Zaim and the Plan to Resettle Palestinian Refugees in Syria.” This last essay, which was trailblazing when published in 1986, describes a peace overture by Husni Zaim, Syria’s short-lived prime minister. Zaim ruled Syria from March 30, 1949, to August 14, 1949, when he was deposed and executed by his colleagues. Working through American and U.N. mediators, Zaim proposed peace with Israel, and also that Syria absorb a quarter of a million Palestinian refugees in exchange for Israeli cession of the eastern half of the Sea of Galilee (according to the U.N. partition resolution, the whole sea was to be within Israeli territory) and, by implication, the Israeli-owned strip of land to the east of the lake, which included Kibbutz Ein-Gev. Israel and Syria were at the time in the middle of armistice negotiations, and Ben-Gurion suspected that Zaim’s move was a ploy to delay Syrian withdrawal from Israeli territory that it had conquered during the war, which Israel was demanding. At the same time Ben-Gurion believed that Zaim was not trustworthy. (The Syrian was apparently a CIA agent and had previously been in intermittent contact with Haganah intelligence officers.) Ben-Gurion was in any case unwilling to give up half of Israel’s major water resource, and to surrender hard-won territory in exchange for a bilateral peace agreement on which the Syrians could at any time renege. He refused to meet with Zaim until the Syrians agreed to withdraw from Israeli territory, and the Syrians rejected the Israeli proposal to negotiate at the foreign ministers level. According to Shlaim, Zaim gave Israel “every opportunity to bury the hatchet and lay the foundations for peaceful coexistence in the long term,” but an “intransigent” Israel and a “short-sighted” Ben-Gurion “spurned” his offer and “frittered away” a “historic opportunity.” A historic opportunity? I am not so sure, and in the absence of Syrian documentation the seriousness of Zaim’s offer and his ability to carry it out remain unclear. (Itamar Rabinovich, in The Road Not Taken, highlighted Zaim’s internal problems in this respect.) Equally unclear is what would have been the fate, after Zaim’s death, of any agreement that he had signed. It is also worth asking whether a semi-arid country should give up half of its main water resource (and territory) in exchange for a peace treaty of doubtful longevity with a country that has just attacked it. Shlaim, intent on pillorying Israel, does not ask this question. On the face of it, Shlaim’s essay on the Balfour Declaration--the British declaration of November 2, 1917, which supported the establishment of a “Jewish national home” in Palestine--appears to be a straightforward inquiry into what happened and why, based on the documents. Yet it exudes an unscholarly myopia, a selectivity in the use of documents, which hints at anti-Zionist prejudice. Why did the British issue such a seemingly uncalled-for and unrealistic declaration? After all, the Zionists, even “the Jews,” had little power in or over the British government or any other major government, and a very meager presence in Palestine itself. (In 1917 there were some 55,000 Jews and 650,000 Arabs in the country.) Indeed, the only Jew in the British government, Edwin Montagu, fiercely opposed Balfour’s declaration, and most of the world’s Jews were non-Zionists or anti-Zionists. All knew it would alienate tens of millions of Arabs and perhaps many Muslims besides. So why did Britain issue the declaration? Shlaim devotes several pages to reviewing the prevailing explanations. Leonard Stein, in his classic study The Balfour Declaration, suggested that it was due to “the activity and skill [as a persuader]” of Zionist lobbyist and leader Chaim Weizmann. The historian Mayir Verete offered a contrary thesis: that the British government was motivated by “British imperial interests in the Middle East”--that is, safeguarding the Suez Canal from the east and keeping France out of Palestine. As an afterthought Shlaim adds that the British may have hoped to “enlist the support of the Jews of America and Russia” for the anti-German war effort, or to pre-empt a similar declaration by the German government. Again, imperial British wartime interests. Shlaim then gives pride of place to Tom Segev’s explanation in his book One Palestine, Complete--“a [historiographic] step forward,” Shlaim calls it. According to Shlaim, quoting Segev, David Lloyd George, Britain’s prime minister in 1917, pushed the declaration out of “ignorance and prejudice.” Lloyd George “despised the Jews, but he also feared them,” believing in their world-embracing “power and influence.” The people who sired the document “believed the Jews controlled the world,” says Shlaim, quoting Segev. Which is to say, the Balfour Declaration was primarily a product of anti-Semitism. Historians love paradoxes, even fictitious ones. It is in order that we may send a message to every land where the Jewish race has been scattered, a message that will tell them that Christendom is not oblivious of their faith, is not unmindful of the service they have rendered to the great religions of the world, and most of all to the religion that the majority of Your Lordships’ house profess, and that we desire to the best of our ability to give them that opportunity of developing ... those great gifts which hitherto they have been compelled to bring to fruition in countries that know not their language and belong not to their race? This is the ideal which I desire to see accomplished, that is the aim that lay at the root of the policy I am trying to defend; and though it be defensible indeed on every ground [he means imperial interests, and so on], that is the ground which chiefly moves me. Shlaim once said that he believes historians should not merely describe and analyze but also act as “judge and jury” (or was it “judge, jury, and executioner”?) --that it is their responsibility to pass moral judgment on the actions (and the thinking?) of their protagonists. He has a powerful confidence in his own “moral compass.” He once wrote that I had lost mine. I do not believe that historians should moralize in their historiography: it is a sign of hubris, and it is tedious. My belief is that historians should seek truth, not “justice,” and describe and analyze events, using as wide a range of sources as possible to try and work out why people acted as they did and what were the consequences--and then let the reader judge, using his or her own “moral compass,” whether the protagonists were right or wrong, wise or unwise. Shlaim concludes his essay on the Balfour Declaration with the flat personal assertion that “I can only agree with Sir John Chancellor [British high commissioner to Palestine, 1928–1931] that the Balfour Declaration was a colossal blunder--it has proved to be a catastrophe for the Palestinians and it gave rise to one of the most intense, bitter, and protracted conflicts in modern times.” But of course it was not the declaration but Zionism itself--the successive waves of Jewish immigration to Palestine, and the creation of Jewish social and political and economic institutions there, with the aim of recreating a sovereign Jewish state--that gave rise to the conflict. In 1967, Israel conquered the West Bank, East Jerusalem, the Golan Heights, Sinai, and the Gaza Strip. In November of that year, the U.N. Security Council passed Resolution 242. The resolution, Shlaim informs us, stressed “the inadmissibility of the acquisition of territory by war, and the resolution … called on Israel to give up the territories it had captured in return for peace.” Actually, the resolution, in its definitive English version, spoke of giving up not “the territories” but “territories,” as Shlaim notes elsewhere in his book. “But,” he continues, “Israel preferred land to peace.” Actually, it has been a mixed bag--as Shlaim well knows. 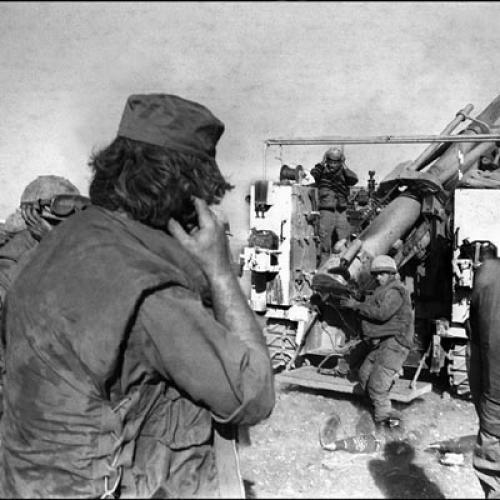 Israel gave up the Sinai Peninsula in exchange for peace with Egypt, and hundreds of square kilometers of territory in exchange for peace with Jordan, and on June 19, 1967 (and, again, in 1994–2000) offered to give up the Golan Heights in exchange for peace with Syria. It has also given up the Gaza Strip without getting any peace in return. In the case of the West Bank and East Jerusalem, matters have been more complicated and Israel has been less “giving.” But historically speaking, the bald claim that “Israel preferred land to peace” is something less than a half-truth. As for the future, Shlaim writes: “The only fair and reasonable solution is the partition of Palestine … a two-state solution.” Presumably he means a Jewish state called Israel in the pre-1967 borders and a Palestinian Arab state composed of the West Bank, Gaza, and East Jerusalem. He does not tell us whether he is amenable to minor border changes between the two states to allow, say, for the incorporation in Israel of Jewish settlement blocs along the Green Line (the pre-1967 demarcation line between Israel and the West Bank) or, for that matter, of border-hugging Israeli Arab settlements in a Palestinian state. All in all, there is much to be said for Shlaim’s credo. The problem with Israel and Palestine is the dissonance, which is sometimes very jarring, between these lofty professions of faith and Shlaim’s assertions (and their tone) about the very recent history of the conflict, which are not just critical of Israel’s post-1967 expansionism, but also unrestrainedly anti-Zionist and anti-Israeli. On page 307, for example, he tells us that the establishment of Israel “involved a monumental injustice to the Palestinians,” and goes on to quote a leading British Foreign Office anti-Semite, John Troutbeck, in 1948, to the effect that the Americans were responsible “for the creation of a gangster state headed by ‘an utterly unscrupulous set of leaders’.” Shlaim comments: “I used to think this judgement was too harsh,” but then Israel’s “vicious” assault on Gaza in December 2008–January 2009 “reopened the question.” His logic here is faulty: either Israel’s leaders in 1948 were “unscrupulous” and Israel was, at its inception, a “gangster state,” or it was not. These have nothing to do with how Israel behaved, or allegedly behaved, sixty years later. But more alarming than Shlaim’s lapse of logic is the content of his assertion, which seems to involve a renunciation of the credo that I have just outlined. “Legitimate” and “gangster state” have some difficulty in co-existing. Palestinian political aspirations, then and now, were “just,” according to Shlaim. He never applies the word to Zionist aspirations, before 1948 or after. Was Israel’s establishment “just,” and is its continued existence “just,” in light of the monumental “injustice” that it caused the Palestinians? Should the Jews never have established their state in Palestine? Shlaim implicitly leaves on the table the standard Palestinian argument that the Palestinians have had to pay for an injustice committed against the Jews by others. Nowhere in this book does Shlaim say a word about the Jewish people’s three-thousand-year-old connection to the Land of Israel--that this land was the Jewish people’s cradle; that they subsequently ruled it, on and off, for over a thousand years; and that for the next two millennia, after going into exile, they aspired and longed for repatriation. Nor does he mention that the Arabs, who had no connection to Palestine, in the seventh century conquered the land “unjustly” from the Byzantine Empire and “illegally” settled in it, forcibly converting it into an “Arab” land. If conquest does not grant rightful claim, then surely this should be true universally? Nowhere does Shlaim tell us of the persecution, oppression, and occasional mass murder of Jews by Muslim Arabs over the centuries, starting with Muhammad’s destruction of the Jewish communities in Hijaz and ending with the pogroms in Aden and Morocco in 1947–1948. And nowhere does Shlaim point out that the Palestinian Arabs had an indirect hand in causing the death of European Jewry during the Holocaust, by driving the British, through anti-British and anti-Zionist violence, to shut the gates of Palestine, which was the only possible safe haven, after the United States and the Anglo-Saxon world had shut their gates to escaping European Jews. And, more directly, Palestinian (and other Arab) leaders contributed to the Holocaust by politically supporting Hitler and, in the case of Haj Amin al Husseini, actually working in Berlin for the Third Reich, peddling Nazi propaganda to the Arab world and raising troops for the Wehrmacht. To be sure, in the Second Intifada there was quite a bit of “savagery”--but most of it was Palestinian. I know that terrorism is the inevitable--and for Shlaim and his ilk, the “understandable”--weapon of the weak. But the massive terrorism of the Palestinians, religious and so-called secular (both Hamas and Fatah suicide bombers believed that they were headed for heaven), truly merited the designation “savage”; and it was the series of suicide bombings that culminated in the Passover bombing at the Park Hotel in Netanya, with thirty-five dead and dozens of severely wounded, that triggered the IDF reoccupation of the Palestinian cities, which was actually conducted with great care for the lives of civilians. Though the Palestinians shouted “massacre” at every turn, as they have done for more than sixty years whenever Israel retaliates following their own acts of savagery, there was almost no deliberate killing of civilians by Israel in the four-year-long Second Intifada (whereas most of Israel’s 1,300 or so dead were deliberately targeted civilians). Of the four thousand Arabs killed, less than one-third were civilians. This is not nothing, but it is not quite what Shlaim says it is. The Israeli Air Force did not, as Shlaim states, “bomb refugee camps.” Had it done so, there would have been hundreds or thousands of dead after each mission, but this was not the case. The IAF bombed specific targets in refugee camps (and outside them)--terrorist headquarters, the homes of terrorist leaders, military bunkers, and so on. There certainly were casualties--but this was inevitable, given that the Palestinians, in 2002 as today, placed their arsenals, their command posts, and their hideaways inside and on the peripheries of refugee camps. During the Israeli assault on Hamas in Gaza at the end of 2008, the Hamas leaders sat out the campaign in the basement of Gaza’s Shifa Hospital, gambling-correctly--that Israel would not bomb or storm a hospital. And is Shlaim fair in his description of Sharon’s career? Take the phrase “the most savage brutality.” Presumably he is referring to the young Sharon who, in October 1953, led the infamous IDF attack on the West Bank village of Kibya, in which about sixty villagers were killed (in retaliation for a terrorist grenade attack at the nearby Israeli settlement of Yehud, in which a mother and her two children were murdered). If Kibya may be described as “the most savage brutality,” then what words are left to describe, say, Iraq’s gassing of thousands of Kurds in the 1980s, or the Sudanese Arabs’ mass murder of Darfurians and Christians, or Syria’s slaughter of twenty thousand or so Muslims in its own city of Hama in 1982? Were Sharon’s various campaigns, including the assault on the PLO in Lebanon and the reoccupation of the West Bank’s cities in 2002, after a string of suicide bombings claimed hundreds of Israeli lives in Tel Aviv, Netanya, Haifa, and Jerusalem, really “attempts to destroy the Palestinian people”--as, say, Turkey’s slaughter of the Armenians in World War I or Hitler’s murder of the Jews in World War II, were “attempts to destroy” peoples? Orwell would have charged Shlaim with abusing the English language, and noted, too, that Shlaim’s careless and inflammatory hyperbole is always directed against only one party. When it comes to the Arabs, Shlaim is often mealy-mouthed, hesitant, disingenuous, and laudatory. Thus he tells us at one point that “the Palestinian people succeeded in building the only genuine democracy in the Arab world with the possible exception of Lebanon and Morocco.” I am sure that the imprisoned opponents of the absolutist monarchy in Rabat would be much amused--as would various Shiites, Greek Catholics, and Sunni Muslims in Lebanon. So would the Fatah prisoners tortured in Hamas jails in Gaza, and the Hamas prisoners tortured in Fatah jails in the West Bank. Does a single relatively open and successful general election transform a polity into a democracy? One-sidedness and plain unfairness permeate almost every subject touched and every argument propounded in Israel and Palestine, perverting and distorting history. Take Shlaim on the post–Second Intifada Sharon. In 2005, breaking away from the Likud, Sharon uprooted all Israeli settlements in, and withdrew from, the Gaza Strip, and indicated that he intended a similar unilateral withdrawal--as he believed there was no peace partner on the other side with whom he could reach agreement--from the bulk of the West Bank. The evacuation from Gaza should have cheered Shlaim, who supports Israeli withdrawal from the territories. Instead he divines a nefarious plot, hatched with George W. Bush’s complicity. “The real purpose behind the plan,” Shlaim writes, “was to sweep away the remnants of Oslo, to undermine the position of Yasser Arafat and the Palestinian Authority, and to derail the road map [for a two-state solution]…. The plan is a pitch for politicide.” Presumably, if and when Israel pulls out of the bulk of the West Bank--again unilaterally, as there is still no credible Palestinian partner for peace--Shlaim will continue to inveigh against Israeli plots and Israeli-American conspiracies. Sharon, who a few months after the Gaza pullout had a massive stroke and departed the political arena, never made clear how much of the West Bank he intended to evacuate. He was the driving spirit behind the construction of the security barrier separating the territory from pre-1967 Israel. The barrier probably indicated the lines to which Sharon intended to withdraw, though the initial motivation for building the barrier was to keep out suicide bombers, and in this purpose it was highly successful. The barrier--more than 90 percent of it is a fence, though Shlaim refers to it, in line with common Arab and Western usage, as “the wall”--incorporates (or will do so, when it is finished) about 7 percent of the West Bank into Israel. This 7 percent includes the large border-hugging settlement blocs that Israel intends to keep, and that both President Clinton and President Bush agreed should be ceded to Israel, with Israel compensating the Palestinians with land elsewhere. In Shlaim’s account, however, the “wall will gobble up by the time it is completed … 15 to 25 percent” of the West Bank--an exaggeration by 200 to 300 percent--and, alongside the Barak-Clinton peace plan (or “parameters”) of July and December 2000, will slice up the West Bank into several “bantustans,” preventing a contiguous Palestinian state. Shlaim fails in this volume to properly describe what was without doubt a historic turning point in the conflict: the Barak-Arafat-Clinton negotiations in Camp David in July 2000, and the subsequent “Clinton Parameters” of December 2000. He fails to inform his readers even of what it was that the Palestinians were offered. Instead he declares that “the most fundamental cause of the failure … lies not in Arafat’s psychological makeup but in Barak’s package.” He singles out Barak’s demand that the Palestinians agree that the offered package would be final--that is, agree to an “end of conflict” and an “end of claims.” “This remorseless insistence on finality,” Shlaim explains, “was in fact part of the problem, not the solution,” as if most peace treaties include a loophole that one of the parties may resume hostilities after signing the treaty if all its demands are not met. The Barak offer--a Palestinian state on 100 percent of the Gaza Strip and 91 percent of the West Bank--“was a reasonable basis,” Shlaim says, “for an interim agreement, not for the final end of the conflict.” Is Shlaim hinting here that he supports such Palestinian demands as the full repatriation of the five million refugees to the territory of pre-1967 Israel, the “right of return” espoused by the PLO and Hamas (and all the Arab states)? He doesn’t tell us. Nor, indeed, does he tell his readers that Clinton, in his “Parameters,” substantially upped the ante by awarding the Palestinians 95 percent of the West Bank, and sovereignty over half of Jerusalem and the surface area of the Temple Mount--and that the Palestinians again responded with a flat “no.” Again, bizarrely, Shlaim speaks of an Israeli-American “conspiracy” to “corner” the lamb-like Palestinians, which they rightly defied. Nowhere in this volume is Shlaim more scathing than in his criticism of Israel’s retaliatory assault on Hamas in Gaza in December 2008–January 2009. “Merciless,” “unremitting brutality,” “totally disproportionate,” “indiscriminate”: these are some of the phrases he uses. He concludes his book by asserting that Israel has “become a rogue state with ‘an utterly unscrupulous set of leaders’ … In Gaza it went too far: It sowed the wind and it will surely reap the whirlwind.” Is he referring to a possible Iranian nuclear attack on Israel? Is he justifying it in advance? Shlaim hears what he wants to hear, not what is actually said. The “moderate” Hamas leader Ismail Haniya almost daily repeats that Hamas will never recognize Israel, and less frequently says that it will continue the struggle until all of Palestine reverts to Palestinian Muslim rule. Hamas “extremists” such as Khalid Mashal speak even more firmly about Israel’s eventual demise and its replacement with a Muslim polity governed in line with sharia law. Indeed, sharia has been gradually imposed, without much fanfare, in the Gaza Strip since Hamas gained dominion there--no mixing of the sexes in public, harsh dress codes, no alcohol, no cinemas, no Internet cafes, and, gradually, no Christians (a few have been murdered, most have left). True, Hamas’s leaders over the past few years have sometimes spoken about a prolonged truce--if Israel first agrees to withdraw to the 1967 borders and accepts the “right of return” of the refugees. Is this tantamount to accepting a two-state solution? Of course not. And we are talking tactics, not strategy. Hamas, despite massive pressure by the Palestinian Authority, Israel, and the United States, has been firm in resisting changes in its political goals, which are the destruction of Israel and the imposition of sharia law. When Hamas leaders amend the Charter in accordance with Shlaim’s irenic fantasies, I will start to believe that it is changing; but not a moment before. About Israel’s restrictions on the flow of goods into the Gaza Strip since the Hamas takeover, Shlaim observes that “the aim was to starve the people of Gaza into submission” and resulted in “a humanitarian catastrophe.” This is simply wild. Darfur is a humanitarian catastrophe. Somalia at times has been a humanitarian catastrophe. But Gaza? As far as I know, no Gazan has died of thirst or starvation. There are no African-style bloated bellies there. It is true that Israel has barred the importation of iron and steel and other materials needed for reconstructing houses destroyed or damaged in the December 2008–January 2009 campaign (and, in my view mistakenly, also barred the entry into Gaza of various other goods). But Israel argues, with solid logic, that Hamas would immediately use these materials to rebuild bunkers, munitions storage facilities, trenchworks, and the other institutions and instruments of its aggression. Without a doubt, history has ill-served the Palestinians. They became a separate and distinct “people” (while remaining part of the greater Arab “people”) as a result of the Zionist enterprise and the Zionist challenge, and Zionism has caused them repeated bouts of suffering. Their persistent rejection of compromise, as expressed by their successive leaders, has had a major role in the perpetuation of this suffering. And this suffering appears to fuel Shlaim’s animosity toward Israel. But there is a mystery here. Many intellectuals, in Israel as in the West, have been moved by the Palestinians’ history and their plight, but at the same time they have remained sympathetic to Israel’s predicament, and admiring of its real and in some ways incomparable achievements over the past six decades. In Israel and Palestine, by contrast, there is no sign of any such complex sympathy. For Shlaim, Israel and its leaders can do no right. It all begins to seem very personal. What is the source of this bias and this resentment? It is always hazardous to speculate on the motives of writers and scholars. Perhaps one day Shlaim will enlighten us on this score. Benny Morris is a professor of Middle Eastern history at Ben-Gurion University and the author, most recently, of 1948: A History of the First Arab-Israeli War (Yale University Press).